Divine Mercy: 1598 I saw how unwillingly the Lord Jesus came to certain souls in Holy Communion. 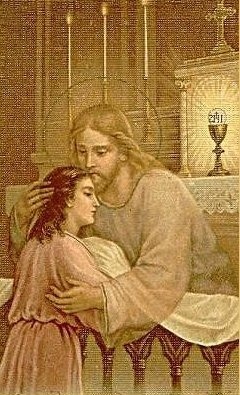 1598 I saw how unwillingly the Lord Jesus came to certain souls in Holy Communion. And He spoke these words to me: I enter into certain hearts as into a second Passion. 1599 As I was trying to make my Holy Hour, I saw the suffering Jesus, who spoke these words to me: My daughter, do not pay so much attention to the vessel of grace as to the grace itself which I give you, because you are not always pleased with the vessel, and then the graces, too, become deficient. I want to guard you from that, and I want you never to pay attention to the vessel in which I send you My grace. Let all the attention of your soul (5) be concentrated on responding to My grace as faithfully as possible. 1600 + O my Jesus, if You Yourself do not soothe the longing of my soul, then no one can either comfort or soothe it. Your every approach arouses new raptures of love in my soul, but also a new agony; because, despite all Your approaches to my soul, even the most exceptional, I am still loving You from a distance, and my heart dies in an ecstasy of love; because this is still not the complete and eternal union, although You commune with me so very often unveiled [as if face to face]; nevertheless, You thereby open in my soul and heart an abyss of love and desire for You, my God, and this bottomless abyss, this total desiring of God, cannot be completely filled on this earth.